How Do Specialty Features Change the Appearance of Fireplace Surrounds? As a homeowner, you want unique elements that make your home stand out from others. By incorporating specialty features in fireplace surrounds, even cookie-cutter homes take on a completely new persona. If you have a fireplace in your home, this is an excellent way to create a look that is conducive to your lifestyle. There are two places in the home that people gravitate to, the kitchen and a room with a fireplace. Especially during the cold winter months, a roaring fire is the best way to take the chill out of a room. Fireplace surrounds can be transformed with specialty features that make the room even more inviting for family and friends. Just because a fireplace is a utilitarian feature of the home does not mean that it has to be plain and uninteresting. With the right specialty features, the fireplace becomes a remarkable accent. In fact, some fireplace surrounds look more like a piece of expensive art. If you are tired of an outdated fireplace and want something new and exciting, specialty features are the ideal solution. You might consider a wrap, which can be a standalone feature or set with a mantle and/or hearth. With this, you can choose the preferred color and texture. This type of fireplace surround has a clean, refined look that is perfect for dens, home offices, and great rooms. If you want something that is more traditional, then custom inset panels and a flush hearth are ideal. Finishing the look with limestone adds character and charm. For a larger room or when trying to capture old world charm, fireplace surrounds with a Coraline limestone finish are stunning. One option is a white finish with a flush hearth and open joints on the seams, turning the fireplace into a focal point where everyone wants to gather. 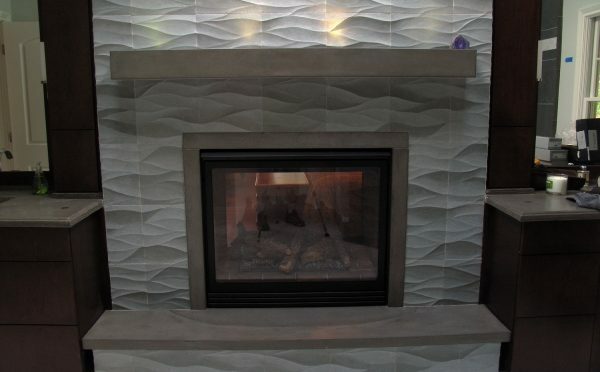 Whether you choose a two-sided fireplace surround, a custom art deco wrap, or something entirely different, specialty features make all the difference.